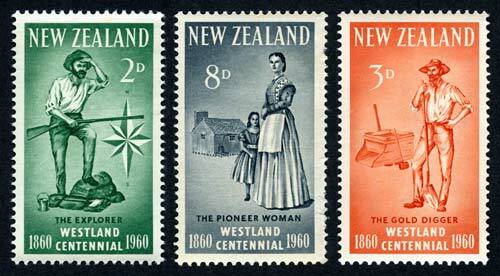 These stamps were issued in 1960 to commemorate the centenary of the sale of Westland by Māori to the New Zealand government. The two men shown on the stamps were an explorer and a gold digger. By contrast, the woman on the eightpenny stamp was a pioneer mother and homemaker.